After the sale of our previous demo-car, we decided it was time to come back to our roots: Toyota. This car has helped us greatly to promote and test our products, such as Weds-wheels, Dixcel-brakes, Cusco LSDs, Bride Seats, HPI Racing Harnesses, Yokohama tires and many other products. However, being in the Tuning business that is a fast moving industry, it's important to keep evolving and looking into new perspectives. 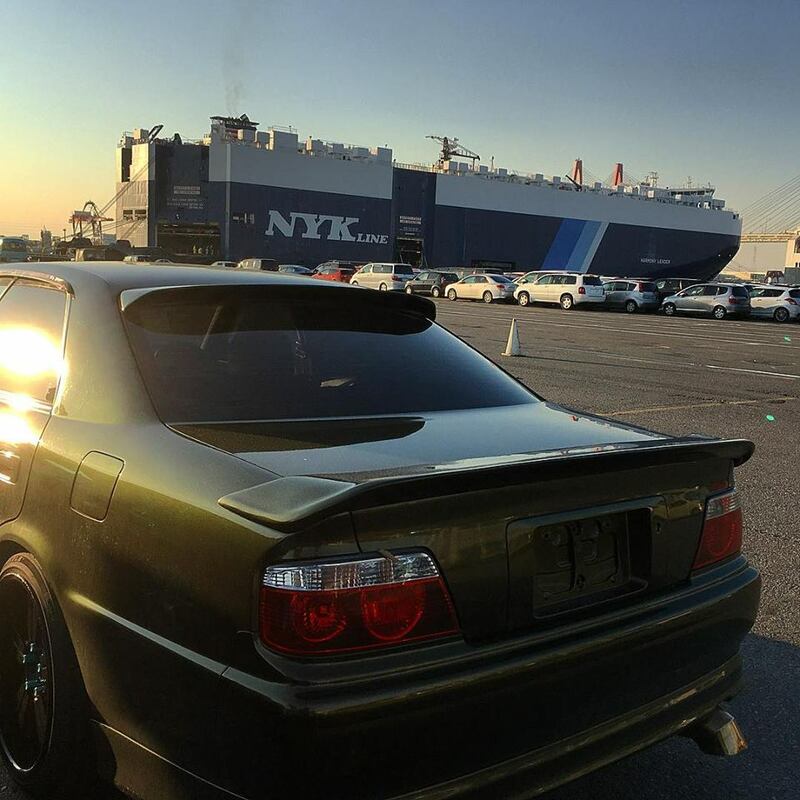 This time, Jesse decided he wanted to pursue his goal of getting a Toyota Chaser JZX100 (Tourer V). The idea came in 2008, from attending D1GP in Ebisu Circuit in Japan and seeing Daigo Saito making wild moves with such a huge car! Sure enough, 10 year later, here she is! Let us introduce our "new" Demo/Project Car! 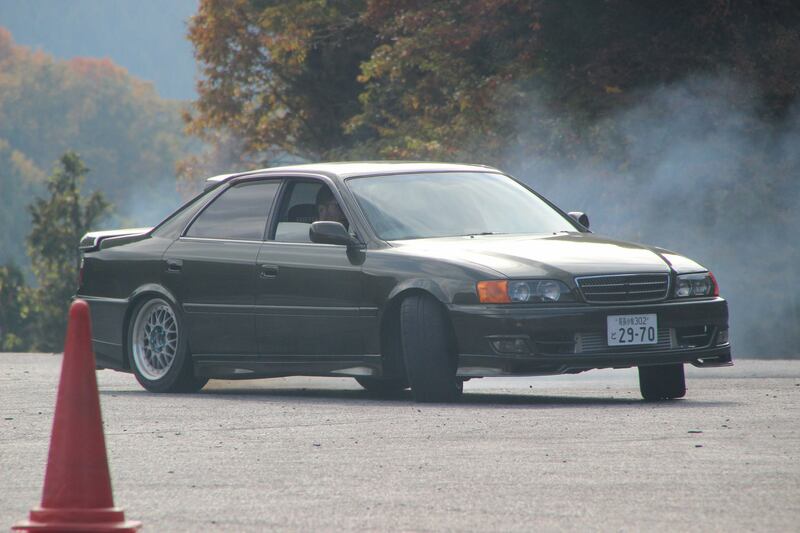 Here is our 1998 Toyota Chaser JZX100 Tourer V, 5 Speed Manual Transmission, with the legendary 1JZ VVTI Engine. What better way to get to know the car by taking some drift lessons in Japan with our Friend Atsushi Taniguchi D1GP and Formula D Driver in his Drift School! 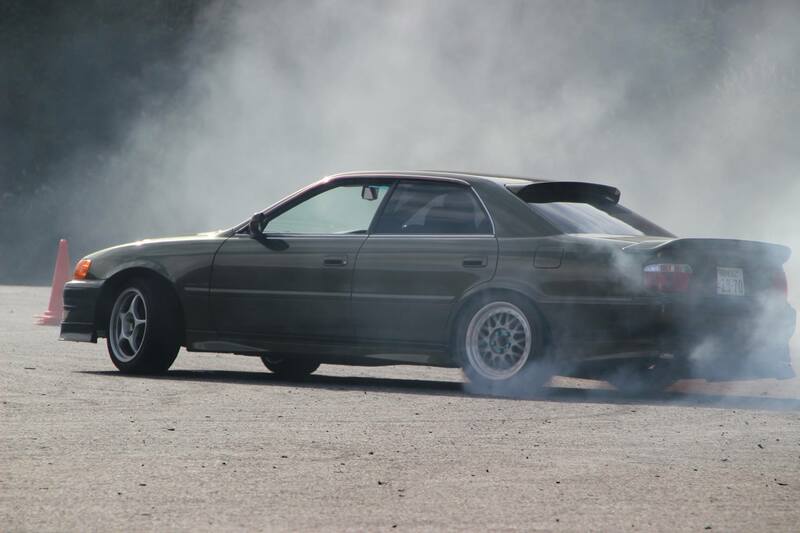 As you can see, the stock 1JZ VVTi Engine has more than enough power to make decent amounts of smoke! The fun factor was unreal! Once the tires supplied for the day were finished Jesse took the car back to get it ready for getting exported from Japan. The car was then loaded onto the boat in Nagoya Harbor and shipped to Switzerland. Roughly 5 weeks later she arrived in Switzerland. Here is the state in which she was when she arrived after a little bit of cleaing. Note the old school 3 piece Enkei Wheels that came with the car. As you can tell, the ride height is quite high so the car could be loaded/unloaded of the Shi p(this will be changed ASAP). You can see that, with every angle, the car has a different color. Its difficult to say if it's green, gold, yellow, brown? Jesse just loves the color! As it appears, it's a custom color. This means no color code available sadly. Figuring it out will be difficult :-) What do you guys think? do you like it? Interesting coincidence, the suspension on this car is none other than the Apexi N1 Evolution coilover kit. There will be some setting needed tough. Being the Swiss and European distributor, this was a good surprise! The ride is actually very pleasent on Swss roads! Behind the stock bumper you can see the huge Greddy Trust Intercooler kit! The Fog lights are also typically Japanese with the flashy yellow color! 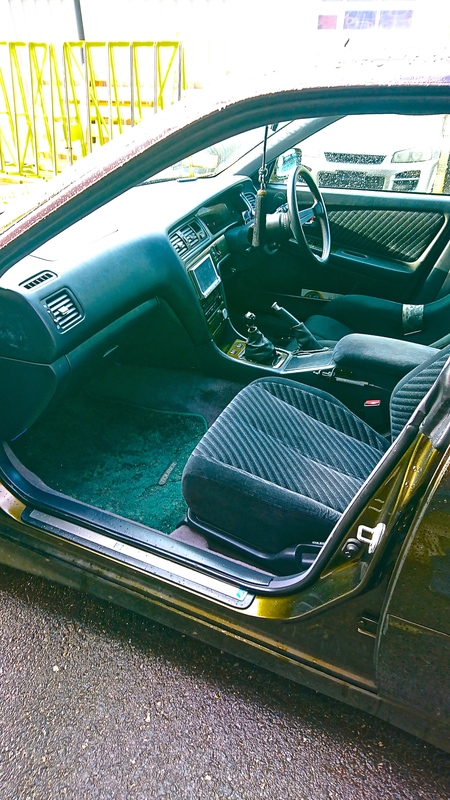 Enjoy the end of nineties interior. The colors are sort of unusual but it still has a very cool vibe to it. The Color is just amazing! I will follow this project closely. Will this be a race or road car? Thank you! I think so too! This car will be built to drive on the road (including EU, swiss homologation). It will be mainly drift and vip style combined.